Text2PDF is a free Windows 8 text to PDF converter app available under ‘Tools’ section of its app store. As the names says, Text2PDF lets you create a PDF document out the text that you type in or paste in the given PDF sheet. Yes.. you can easily copy text from anywhere and paste it in the blank PDF sheet provided by this Windows 8 text to PDF converter app. For this, you need to right-click anywhere on the blank screen and instantly you will find options such as Paste, Undo, and Select All. 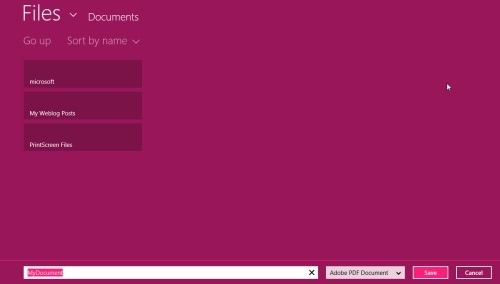 Once you have successfully created a PDF file on this amazing Text2PDF Windows 8 app, you can now save it on your local Windows 8 machine. The interesting part about this Windows 8 app to convert text to PDF is that you can protect your PDF file using a strong password. To get all these options, you need to right-click on the bottom of the screen. It’s very easy to create a PDF document from a simple text. 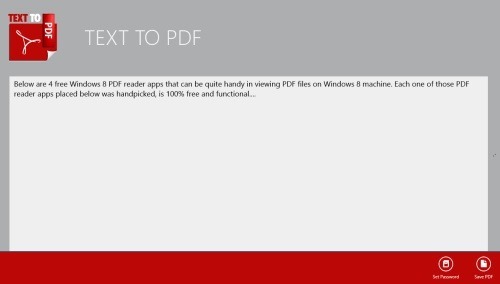 Let me quickly point out the main features of this Windows 8 text to PDF converter app. Lets you create a PDF document out of the text you type in or paste in the given PDF sheet. Lets you save a converted text to PDF in your local Windows 8 system. You can easily protect your PDF doc. using a strong password. Options such as Paste, Undo, Select All, Set Password, and Save PDF are easily available. It’s very simple and easy to convert text to PDF doc using this app. Well.. I really liked this PDF converter app. It simple and easy.. right from converting text to PDF doc, to saving it to you local machine, to password protect your PDF file, you can do just everything using this amazing Text2PDF tool. Also, check out our posts on PDF Reader apps, and PDF to Image. You will soon find your app opened in Windows 8 store from where you can proceed with further installing instructions. In short, Text2PDF is a good utility text to PDF converter tool to get you text converted to a PDF document. Go ahead and download Text2PDF app in Windows 8 now.